With Marianne and Marcelline Filliou. 1. a) Video Dinner, b) Four-Dimensional Space Time Continuum, c) Recycling, d) Sky Analysis, e) Bedtime Her/His Story; footnotes. 2. Travelling Light – It’s a Dance Really. 3. Video Breakfasting Together, If you Wish. 4. Footnote to Footnote A, Video Breakfasting with Roy Kiyooka. It’s a 5 billion year project (“at least”, says Kate) involving the use of video as an active (i.e., not passive) audience participation tool. 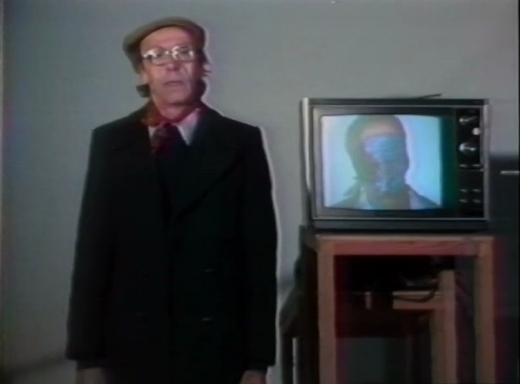 The first video contains And So On, End So Soon: Done 3 Times (1977) AND Teaching and Learning as Performing Arts Part II parts A through E and footnotes A through E (these parts make up part one of Teaching and Learning). The third video contains Video-Breakfasting…Together, If You Wish (part three of Teaching and Learning) and Footnote to Footnote A: Video-Breakfast with Roy Kiyooka (parts three and four of Teaching and Learning).